Powers/Abilities: Despite his age, SJ North is a trained government agent with access to technology and resources. (Dakota North#5 (fb) - BTS) - SJ's wife, Caroline, died when her car exploded. SJ was left to raise his children Dakota and Ricky by himself. (Dakota North#4 (fb) - BTS) - SJ took Ricky all over the world on various assignments. (Dakota North#1 (fb) - BTS) - SJ fought international crime leader Otto Shanks at some point. (Dakota North#1) - When SJ sought to send Ricky to live with Dakota, Ricky was irate and argued until SJ, who stopped a hooligan from robbing Ricky's radio with a gun, promised to pay him $200 per week. Weeks later, SJ delivered news to Dakota that her husband was trying to reach her. (Dakota North#2) - SJ and his former CIA companion George C. Cooper waited for Dakota in the Rainbow Room. When she and Ricky finally arrived, SJ demanded she take George as a client and Dakota argued with him about it until the handsome Timas came and asked Dakota to dance. Cooper grew concerned when his security team wasn't answering his calls, and SJ warned him against hiding his team in the men's room anymore. As men drew in around them, he drew out cards to play poker with Ricky. As Dakota informed them she would take the case and that Timas had tried to kill her with an arrow, Cooper lost his poker match to Ricky and gave him the gold pen to hold onto. Ricky gladly took it and showed himself out, despite SJ's reservations. Later, SJ was furious to realize that Ricky had gone missing, and he blamed it all on Cooper. (Dakota North#3) - Dakota was furious at SJ for Ricky being missing, kicking over one of her targets until Amos restrained her, seeking to calm her down, but she rushed out. He soon got a call from an ally in Paris, Guy Beaumontain, who told him Ricky was there. SJ told Guy to get Ricky some funds and help him return home. SJ gave Dakota the news and she rushed off to Paris despite his request she stay. She asked Mad Dog to contact Yvon, who ran her office in Paris. SJ shocked Dakota by making travel arrangements to Paris for her. Cooper recounted how dangerous the nerve gas was to SJ. (Dakota North#5) - SJ and Cooper continued yelling about Dakota and Ricky's fate while Mad Dog struggled to get work done. As SJ yelled at Mad Dog for being in a band, he was shocked to learn that Mad Dog was looking into Cleo Vanderlip. SJ rushed off to Rycom to confront Cleo, leaving Mad Dog and Cooper behind. Cleo confronted SJ when he rushed in furiously. She drew a gun and taunted him about his dead wife, Caroline. Cleo dismissed her guard, David. SJ kept asking her about his children, not knowing they had already made it safely back to the USA. (Web of Spider-Man#37 (fb) - BTS) - SJ had sent Ricky to live with Dakota, and she and SJ grew more estranged. (Marvel Super-Heroes III#3/2 - BTS) - Out shopping at a local mall, Dakota bought a new outfit, telling the salesperson to bill her father for it and to include a card that said "thanks for the surprise birthday gift." (Daredevil II#109 (fb) - BTS) - After 9/11, crime on the docks slowed way down. Slaughter took over the dock business, forming an agreement with the feds to keep things under control. (Daredevil II#110 (fb) - BTS) - The feds overlooked Slaughter’s crimes, focusing on looking at terrorism. When one of Slaughter’s men, Floyd, violently murdered a dock worker and three children, the feds felt they needed to cover things up or risk exposure. Agent Purcell, part of a rogue task force, found Big Ben Donovan in jail and ordered him to take the rap for the crimes and be sentenced to death or they would potentially put his son, Little Ben Donovan, at risk. (Daredevil II#108) - After not speaking to Dakota for years, SJ visited her apartment and advised her to back off the Donovan case. (Daredevil II#109) - Dakota ordered SJ out, but he ordered her to get off the case, telling her she was impeding national security. SJ soon learned from Agent Rollins that Dakota wasn’t backing down. (Daredevil II#110) - When SJ heard that Dakota had been shot, he rushed to the hospital, furious when he met Matt Murdock outside. SJ yelled that it was all Murdock’s fault, but claimed he had no knowledge of the Donovan case. Matt walked away in disgust, claiming SJ was perverting justice itself. SJ had Agent Purcell transferred overseas, had Floyd arrested, and informed Slaughter that his criminal actions would cease. Murdock approached SJ and SJ promised to keep things clean as well as to see Agent Moss, who'd shot Dakota, to pay for his crimes. SJ departed, congratulating Matt on his victory. Comments: Created by Martha Thomases and Tony Salmons. (Dakota North#2 (fb) - BTS) - Former CIA agent George C. Cooper left the agency and wrote a tell-all book about his experiences. Before he left the agency, he stole a golden pen full of experimental nerve gas, having suspected his superior was a mole prepared to sell it. (Dakota North#2) - Cooper and SJ North waited at the Rainbow Room for SJ's children Dakota and Ricky to arrive. SJ demanded she take George as a client and Dakota argued with him about it until the handsome Timas came and asked Dakota to dance. Cooper grew concerned when his security team wasn't answering his calls, and SJ warned him against hiding his team in the men's room anymore. As men drew in around them, he drew out cards to play poker with Ricky. As Dakota informed them she would take the case and that Timas had tried to kill her with an arrow, Cooper lost his poker match to Ricky and gave him the gold pen to hold onto. Ricky gladly took it and showed himself out, despite SJ's reservations. As they left the restaurant, Cooper was attacked by armed men, but Dakota fought them off and scared them away. Cooper wanted to go after them then, but she wanted to wait until she had transportation. His publicist, Dianna Glenn, ran to congratulate him on that morning's interview as he discussed the day's series of interviews that lay ahead. Suddenly, his car exploded, shocking them all, and Dakota rushed him down to the subway. Cooper told Dakota about the golden pen and that Ricky had it. They soon learned from Dianna Glenn that a man had retrieved Cooper's entire itinerary. In the park, Timas attacked, holding a blade to Dakota's throat. He kissed her, warning her to get off the case, then rushed off. After having lunch with Dakota, Mad Dog, and Amos Culhane, Cooper and Dakota were driving when Timas, driving a monster truck, started rushing after them. Dakota avoided the truck by evading on a sidewalk, causing it to crash and Timas was rushed off to the hospital. George soon appeared on television, where Dianna struggled to get him on before someone doing pet tricks. When Dakota and SJ realized Ricky was missing, they were furious. (Dakota North#3) - Dakota was furious at SJ for Ricky being missing, kicking over one of her targets until Amos restrained her, seeking to calm her down, but she rushed out. SJ gave Dakota the news that Ricky had been seen in Paris and she rushed off there despite his request she stay. She asked Mad Dog to contact Yvon, who ran her office in Paris. Cooper tried encouraging SJ that Ricky would be fine. Cooper recounted how dangerous the nerve gas was to SJ. (Dakota North#5) - SJ and Cooper continued yelling about Dakota and Ricky's fate while Mad Dog struggled to get work done. As SJ yelled at Mad Dog for being in a band, he was shocked to learn that Mad Dog was looking into Cleo Vanderlip. SJ rushed off to Rycom to confront Cleo, leaving Mad Dog and Cooper behind. Later, Dakota, Ricky, and Amos Culhane successfully returned, though they told Cooper the gas had been used, leaving the pen canister empty. Daisy Kane arrived, wanting to reconcile with Ricky. (Dakota North#2) - Dianna Glenn, the publicist for George C. Cooper's book, ran to congratulate him on that morning's interview as he discussed the day's series of interviews that lay ahead. Suddenly, his car exploded, shocking them all, and Dakota North, his security guard, rushed him down to the subway. Dianna Glenn took a call from a Roger Nitz about the book and revealed to him Cooper's entire itinerary. She later learned Nitz didn't exist and she apologetically told Cooper what had happened. When George appeared on TV later, Dianna struggled to get him on before someone doing pet tricks. 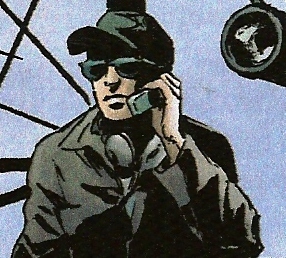 (Daredevil II#109) - On surveillance for SJ North, Agent Rollins used equipment to eavesdrop on the office of Matt Murdock. He reported in that Murdock would be looking into Callinan. (Daredevil II#110 (fb) - BTS) - The feds overlooked Slaughter’s crimes, focusing on looking at terrorism. When one of Slaughter’s men, Floyd, violently murdered dock worker Henry Callinan and decapitated his three kids (David, Ethan, and Frances), the feds felt they needed to cover things up or risk exposure. Agent Purcell, part of a rogue task force, found Big Ben Donovan in jail on an assault charge and ordered him to take the rap for the crimes and be sentenced to death or they would potentially put his son, Little Ben Donovan, at risk. (Daredevil II#109 (fb) - BTS) - When Dakota North started investigating the imprisonment of Big Ben Donovan, not knowing it could affect homeland security, FBI agent Moss was ordered to scare her off it. (Daredevil I#107) - Moss assaulted Dakota North at a diner near Sing-Sing, ordering her to back-off of Donovan and leave things alone. (Daredevil II#108) - Dakota attacked Moss, who’d been riding his motorcycle, with a few blows from a baseball bat. She grabbed his gun and demanded to know the truth about Donovan. He refused to tell her a thing and advised she watch herself. She tossed the gun back and walked away. (Daredevil II#109 - BTS) - Moss shot Dakota through the shoulder. (Daredevil II#110) - Daredevil tracked won Moss and beat him up in an alley, disarming him and knocking out his partner. 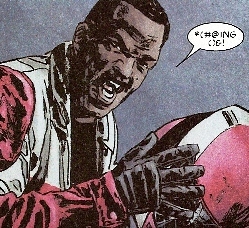 Daredevil broke Moss’ wrist before Moss told him the truth about Donovan. SJ North later vowed to see Moss do time for shooting Dakota.